The ViewSonic VA2246M monitor provides you with an adequate performance for a crisp and sharp Full HD 1080p image quality. As one of the most affordable 22-inch monitors, it offers you the built-in speakers, quick response time, and a sleek design, all of which makes this monitor worth much more. 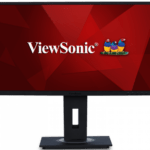 If you’re on a tight budget and need an affordable 1080p monitor, the ViewSonic VA2246M will go easy on your wallet while giving you a brilliant performance. Regardless of its price, the ViewSonic VA2246M PC monitor delivers a crisp and vibrant picture quality. The TN panel of the monitor ensures a quick 5ms response time which eliminates ghosting of fast moving objects and provides you with a highly responsive performance. The viewing angles surpass the common quality that TN panels usually offer by amounting to 160 degrees vertical and 170 degrees horizontal. Therefore, you’ll be able to watch movies while lying in a bed and enjoy the flawless picture quality without colors losing their tint. The dynamic contrast of 10,000,000:1 delivers a superior relation between the darkest and the brightest colors which make for a more vibrant and rich picture quality. However, since the ViewSonic VA2246M features a TN panel, after all, the professional designers and alike won’t be able to efficiently do their color-critical work and should look for an IPS panel monitor instead for the more accurate colors. When it comes to gaming and everyday use, the ViewSonic VA2246M TN screen delivers a remarkable performance. The OSD buttons placed at the bottom bezel of the monitor include a power button, a menu button, a shortcut for input source selection, and up and down arrows for volume adjusting of the built-in speakers and navigation through the menu. The OSD menu is user-friendly and easily navigated and offers settings such as the Auto Image Adjust, Color Adjust, Audio Adjust, and Manual Image Adjust. You can also manually configure parameters of brightness and contrast. The Auto Image Adjust feature allows you to automatically size, position, and fine-tune the image by eliminating distortion and waviness. Under the Color Adjustment segment of the OSD menu, you can choose between a several color temperature presets and manually configure the color levels of the red, green, and blue once in the User Color mode. Audio Adjust includes volume settings, mute option, and the ability to toggle between more inputs if there is any. The ViewSonic VA2246M 1080p display is power efficient and you can further enhance its ability for power saving once you enable the Eco mode. This mode still allows for a crisp and vibrant picture quality while reducing the power consumption from 34W maximum to 12 – 16W. Once the LED power button starts shining in an orange color it indicates that you’re in the power saving mode, whereas it will shine in a blue color when in the regular mode. The design of the ViewSonic VA2246M features a glossy black cabinet while the screen surface is covered with a hard 3H matte coating which eliminates the sunlight reflection. The bezel is about half an inch thick and a bit thicker at the bottom which results in the viewable area of the monitor being 21.5 inches rather than 22. 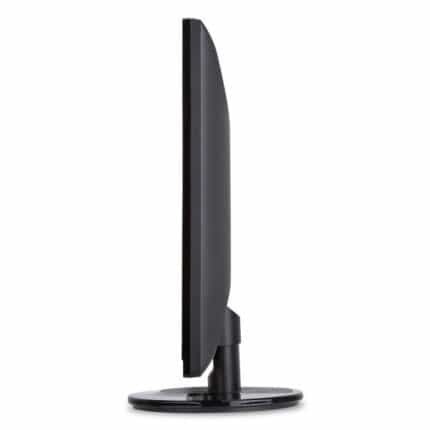 Nevertheless, the appearance of the monitor is modern and sleek, especially considering its price. You can tilt the monitor for 23 degrees and mount it on the wall as it’s VESA mount compatible with the 100 x 100mm pattern. 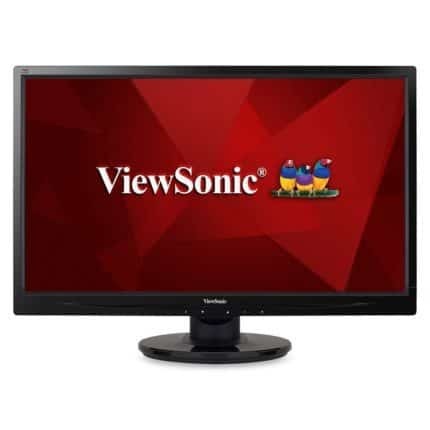 When it comes to the connectivity of the ViewSonic VA2246M monitor, you have a choice between the analog and digital video signals, the VGA or DVI-D. However, only the VGA cable is provided with the purchase. Besides the monitor and the VGA cable, you will also receive a power cable, a quick start guide, ViewSonic Wizard CD with drivers, and a three-year warranty. The monitor also features an audio line-in port for the built-in speakers. The 2W speakers may not deliver a satisfactory performance for everyone, but they are good enough for backup speakers. 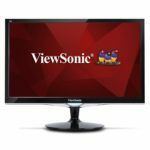 At the time of writing (May 2017), the ViewSonic VA2246M is available for a measly $100. 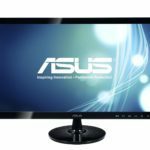 As one of the most affordable Full HD 1080p monitors, it is a perfect budget monitor with some extra features such as the built-in speakers, VESA mount compliance, and the superior viewing angles than the usual TN panel monitors. If you like the design, you could save up some more money and check out the 24-inch version of this monitor, the ViewSonic VA2446M display or the 27-inch version, the ViewSonic VA2746M monitor. The ViewSonic VA2246M display offers quality specifications that surpass what is expected for the price paid. The high-quality image is crisp with vibrant colors while the performance is highly responsive thanks to the quick 5ms response time. The 1080p resolution on a 21.5-inch screen provides a picture quality with rich and vivid details due to the high pixel density. Overall, the performance, display, and the extra features exceed the expectations of a $100 TN panel monitor, making it an ideal choice for those with tight budget seeking a cost efficient 1080p monitor. The ViewSonic VA2246M is an excellent budget monitor with a surprisingly crisp and vibrant 1080p image quality. Moreover, the viewing angles are wider than the usual TN panel monitors, and the built-in speakers come as a nice bonus.